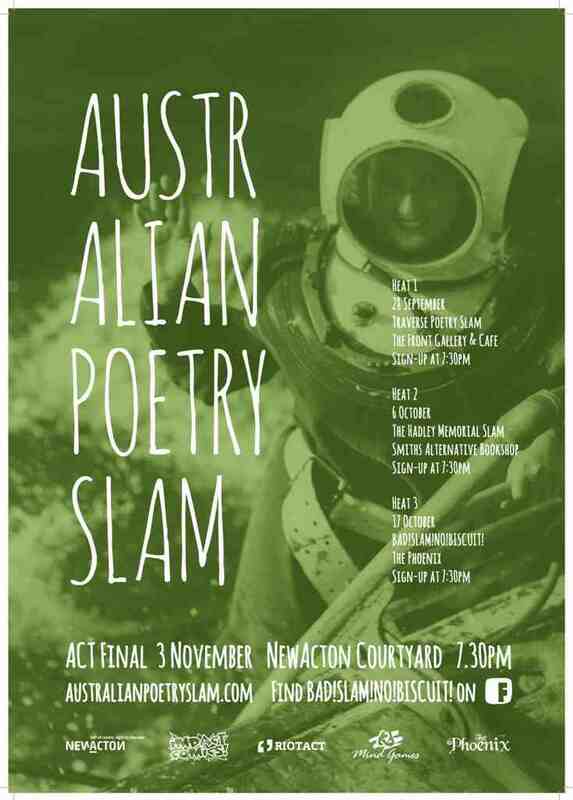 THE THIRD HEAT OF THE AUSTRALIAN CAPITAL TERRITORY AUSTRALIAN POETRY SLAM! Back in the Phoenix Pub! Which means we want your words on the BAD!SLAM!NO!BISCUIT! stage! BAD!SLAM!NO!BISCUIT! is your monthly poetry slam in Canberra that provides you with two minutes, (why won’t they think of the marsupials? ), an audience, A PUBLIC SERVICE ANNOUNCEMENT, two microphones, THE SCORE ADDER, judges – five judges!, (...the marsupials...) more first prizes than ever or ever will be, THE MASTER OF CONFLICT, another MC, A STAGE, The Sacrificial Poet, THE OPPORTUNITY TO LISTEN TO POETRY or not, and the chance to perform whatever words you’ve got. There are some special rules for this heat as it is part of the Australian Poetry Slam. They are here: http://australianpoetryslam.com/rules. "Paul Magee is the author of the surrealist ethnography From Here to Tierra del Fuego (University of Illinois Press: 2000) and Cube Root of Book (John Leonard Press: 2006), which is in verse. He is working on Chapter Twelve, again for John Leonard Press. Paul teaches poetry at the University of Canberra, where he is an Associate Professor. He has published extensively on psychoanalysis, stagnation, boredom and revolution." "Julia Johnson is the frontwoman of Julia and the Deep Sea Sirens. She has been compared to Sarah Blasko and Joni Mitchell, but she has also been compared to Joan Rivers and The Little Mermaid. You might hate her because she likes poems that rhyme, but she promises not to perform one. She knows all the words to Gangster's Paradise, and won the Triple J Unearthed Songwriting Comp earlier this year." So bring your words ‘cause we want them on stage because BAD!SLAM!NO!BISCUIT! is a poetry slam full of marsupials. MARSUPIALS ARE NOT A THEME!